(Fits Vespa PX125 UPTO 2011 also fits PX 200 MY Disc, T5 Classic). GILERA RUNNER 50 and 50 SP upto 2006 MALOSSI SPORT REAR DISC PADS PART NUMBER VM625049 BRAKE PADS sport - MHR - MHR SYNT Brake pads they were born on the racetrack, but they are perfectly suitable for the chaotic driving conditions imposed by our city traffic. Malossi Brake Pads have been designed with new ecological materials (a high percentage of carbon fibre and other metal fibres make up the pad s mixture). - Brake Pads Sport feature increased braking life compared to the original pads and in addition they supply a greater braking power even at lower speeds. - Brake Pads MHR are slower to reach working temperature but provide exceptional braking at elevated speeds where deceleration is needed the most. - Brake Pads MHR Synt : sintered without asbestos, are manufactured . VESPA LX 50 2 STROKE and LXV 50 2 STROKE MALOSSI SPORT FRONT DISC PADS PART NUMBER VM625049 BRAKE PADS sport - MHR - MHR SYNT Brake pads they were born on the racetrack, but they are perfectly suitable for the chaotic driving conditions imposed by our city traffic. Malossi Brake Pads have been designed with new ecological materials (a high percentage of carbon fibre and other metal fibres make up the pad s mixture). - Brake Pads Sport feature increased braking life compared to the original pads and in addition they supply a greater braking power even at lower speeds. - Brake Pads MHR are slower to reach working temperature but provide exceptional braking at elevated speeds where deceleration is needed the most. - Brake Pads MHR Synt : sintered without asbestos, are manufactured with a.
APRILIA APRILIA SRV 850 DISC PADS FOR HENG TONG CALIPER - MALOSSI SYNT - REAR. GILERA GILERA DNA 50 DISC PADS FOR HENG TONG CALIPER - MALOSSI SYNT - FRONT. GILERA GILERA FUOCO 500 DISC PADS FOR HENG TONG CALIPER - MALOSSI SYNT - REAR. HONDA HONDA FORZA 300 DISC PADS - FRONT - MALOSSI SYNT. HONDA HONDA S WING 125 DISC PADS - FRONT ON MODELS 2008 ON - MALOSSI SYNT. HONDA HONDA SH 300 DISC PADS - FRONT ON MODELS 2010 ON - MALOSSI SYNT. MALOSSI SPORT DISC PADS PART NUMBER VM625043 BRAKE PADS sport - MHR - MHR SYNT Brake pads they were born on the racetrack, but they are perfectly suitable for the chaotic driving conditions imposed by our city traffic. Malossi Brake Pads have been designed with new ecological materials (a high percentage of carbon fibre and other metal fibres make up the pad s mixture). - Brake Pads Sport feature increased braking life compared to the original pads and in addition they supply a greater braking power even at lower speeds. - Brake Pads MHR are slower to reach working temperature but provide exceptional braking at elevated speeds where deceleration is needed the most. - Brake Pads MHR Synt : sintered without asbestos, are manufactured with a specific material that makes them . MALOSSI RACE SINTER FRONT BRAKE PADS VM625006 BRAKE PADS Race Sinter - MHR - MHR SYNT Brake pads they were born on the racetrack, but they are perfectly suitable for the chaotic driving conditions imposed by our city traffic. Malossi Brake Pads have been designed with new ecological materials (a high percentage of carbon fibre, kevlar and other metal fibres make up the pads mixture). - Brake Pads Sport feature increased braking life compared to the original pads and in addition they supply a greater braking power even at lower speeds. - Brake Pads MHR are slower to reach working temperature but provide exceptional braking at elevated speeds where deceleration is needed the most. - Brake Pads MHR Synt : sintered without asbestos, are manufactured with a specific material that makes. SUZUKI SUZUKI BURGMAN 400 K3 INJECTION 2003-2006 DISC PADS - MALOSSI SYNT - FRONT. SUZUKI SUZUKI BURGMAN 400 NON INJECTION DISC PADS - MALOSSI SYNT - FRONT ON MODELS 1998 ON. This part is compatible with the following models:-. HONDA HONDA PANTHEON 125 2T 1998-2002 DISC PADS - MALOSSI SYNT - FRONT ON MODELS 1998 ON. HONDA HONDA PANTHEON 125 4T 2004 on DISC PADS - MALOSSI SYNT - REAR. HONDA HONDA SILVERWING 400 DISC PADS - MALOSSI SYNT - FRONT. Top Quality Brake Pads by Malossi. BRAKE PADS FOR PEUGEOT. Item : Brake pads, front -HENG TONG CALIPER ONLY. MALOSSI SPORT DISC PADS PART NUMBER VM625047 BRAKE PADS sport - MHR - MHR SYNT Brake pads they were born on the racetrack, but they are perfectly suitable for the chaotic driving conditions imposed by our city traffic. Malossi Brake Pads have been designed with new ecological materials (a high percentage of carbon fibre and other metal fibres make up the pad s mixture). - Brake Pads Sport feature increased braking life compared to the original pads and in addition they supply a greater braking power even at lower speeds. - Brake Pads MHR are slower to reach working temperature but provide exceptional braking at elevated speeds where deceleration is needed the most. - Brake Pads MHR Synt : sintered without asbestos, are manufactured with a specific material that makes them . VESPA VESPA 100 SPORT BRAKE SHOES 125mm x 17mm SINGLE PIN - MALOSSI POWER - FRONT. VESPA VESPA 125 SUPER SPANISH MODEL BRAKE SHOES 125mm x 17mm SINGLE PIN - MALOSSI POWER - FRONT. VESPA VESPA 50 SPECIAL BRAKE SHOES 125mm x 17mm SINGLE PIN - MALOSSI POWER - FRONT. :: ART. 6216894: MPN ML 6216894 6216894. MALOSSI BRAKE PADS. HOW TO APPROVE THE MALOSSI BRAKE PADS?. During these tests the efficiency is verified through a series of braking is "cold" that under stress, to evaluate the resistance of the pad and its braking performance at different speeds. MALOSSI SPORT DISC PADS PART NUMBER VM629016 BRAKE PADS sport - MHR - MHR SYNT Brake pads they were born on the racetrack, but they are perfectly suitable for the chaotic driving conditions imposed by our city traffic. Malossi Brake Pads have been designed with new ecological materials (a high percentage of carbon fibre and other metal fibres make up the pad s mixture). Brake Pads Sport feature increased braking life compared to the original pads and in addition they supply a greater braking power even at lower speeds. Brake Pads MHR are slower to reach working temperature but provide exceptional braking at elevated speeds where deceleration is needed the most. Brake Pads MHR Synt : sintered without asbestos, are manufactured with a specific material that makes them . APRILIA APRILIA RS4 50 2t with DERBI D50B MOTOR DISC PADS - MALOSSI SPORT - REAR. BENELLI BENELLI ZENZERO 350 DISC PADS - MALOSSI SPORT - REAR. KEEWAY KEEWAY PIXEL 50 2 STROKE KW1E40QMB4 DISC PADS - MALOSSI SPORT - FRONT ON MODELS WITH HENG TONG CALIPER. MALOSSI Ø=150x24mm. £7.95 - Small parcels sent through DPD. Top Quality Brake Pads by Malossi. 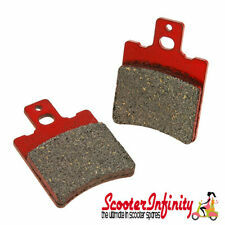 BRAKE PADS FOR APRILIA. Item : Brake pads, front -HENG TONG CALIPER ONLY. APRILIA APRILIA RS4 50 2t with DERBI D50B MOTOR DISC PADS - MALOSSI MHR - REAR. BENELLI BENELLI ZENZERO 350 DISC PADS - MALOSSI MHR - REAR. KEEWAY KEEWAY PIXEL 50 2 STROKE KW1E40QMB4 DISC PADS - MALOSSI MHR - FRONT ON MODELS WITH HENG TONG CALIPER. MALOSSI SPORT DISC PADS PART NUMBER VM625051 BRAKE PADS sport - MHR - MHR SYNT Brake pads they were born on the racetrack, but they are perfectly suitable for the chaotic driving conditions imposed by our city traffic. Malossi Brake Pads have been designed with new ecological materials (a high percentage of carbon fibre and other metal fibres make up the pad s mixture). Brake Pads Sport feature increased braking life compared to the original pads and in addition they supply a greater braking power even at lower speeds. Brake Pads MHR are slower to reach working temperature but provide exceptional braking at elevated speeds where deceleration is needed the most. Brake Pads MHR Synt : sintered without asbestos, are manufactured with a specific material that makes them . YAMAHA YAMAHA T MAX 530 2012 on DISC BRAKE PADS - FRONT - MALOSSI MHR SYNT. We have years of experience within the classic scooter scene, building and riding Vespas and Lambrettas to rallies and events. YAMAHA YAMAHA X MAX 250 DISC PADS - FRONT - MALOSSI SYNT. YAMAHA YAMAHA X MAX 250 INJECTION DISC PADS - FRONT - MALOSSI SYNT. We have years of experience within the classic scooter scene, building and riding Vespas and Lambrettas to rallies and events. SUZUKI SUZUKI EPICURO 125 DISC PADS - MALOSSI MHR - FRONT ON MODELS 1998-2000 - FRONT AND REAR 2001 ON. SUZUKI SUZUKI HOKUTO 110 DISC PADS - MALOSSI MHR - FRONT ON MODELS 1998 ON. This part is compatible with the following models:-. SUZUKI SUZUKI EPICURO 125 DISC PADS - MALOSSI SPORT - FRONT ON MODELS 1998-2000 - FRONT AND REAR 2001 ON. SUZUKI SUZUKI HOKUTO 110 DISC PADS - MALOSSI SPORT - FRONT ON MODELS 2000 ON. We have years of experience within the classic scooter scene, building and riding Vespas and Lambrettas to rallies and events. APRILIA APRILIA RX 50 2006 ON with DERBI D50B MOTOR DISC PADS - MALOSSI SYNT - FRONT ON MODELS 2008 ON. DERBI DERBI GPR 50 1998-2004 DISC PADS - MALOSSI SYNT - FRONT. BETA BETA RR 50 LC ENDURO with MINARELLI AM6 MOTOR DISC PADS - MALOSSI SYNT - FRONT ON MODELS 1988-2003. YAMAHA YAMAHA MAJESTY 250 2001 on DISC PADS - MALOSSI SYNT - FRONT. YAMAHA YAMAHA MAJESTY 250 upto 2001 DISC PADS - MALOSSI SYNT - FRONT. YAMAHA YAMAHA MAJESTY 400 DISC PADS - MALOSSI SYNT - FRONT ON MODELS WITH DOUBLE FRONT DISC. YAMAHA YAMAHA MAJESTY 400 DISC PADS - MALOSSI SYNT - FRONT ON MODELS WITH SINGLE FRONT DISC. YAMAHA YAMAHA T MAX 500 2001-2004 DISC PADS - MALOSSI SYNT - FRONT. This part is compatible with the following models:-. HONDA HONDA SH 125 i ABS 2013 ON DISC PADS - MALOSSI SYNT - FRONT. HONDA HONDA SILVERWING 400 DISC PADS - MALOSSI SYNT - REAR. HONDA HONDA SILVERWING 600 DISC PADS - MALOSSI SYNT - REAR. KAWASAKI KAWASAKI J 300 DISC PADS - MALOSSI SYNT - FRONT. HONDA HONDA S WING 125 DISC PADS - FRONT ON MODELS 2008 ON - MALOSSI SYNT. HONDA HONDA SH 125 DISC PADS - FRONT ON MODELS 2009 ON - MALOSSI SYNT. HONDA HONDA SH 150 DISC PADS - FRONT ON MODELS 2009 ON - MALOSSI SYNT. HONDA HONDA FORZA 300 DISC PADS - FRONT - MALOSSI SYNT. HONDA HONDA SH 150 DISC PADS - FRONT ON MODELS 2009 ON - MALOSSI SYNT. HONDA HONDA SH 300 DISC PADS - FRONT ON MODELS 2010 ON - MALOSSI SYNT. HONDA HONDA SILVERWING 400 DISC PADS - FRONT ON MODELS 2009 ON - MALOSSI SYNT. HONDA HONDA FORZA 300 DISC PADS - FRONT - MALOSSI SYNT. HONDA HONDA S WING 125 DISC PADS - FRONT ON MODELS 2008 ON - MALOSSI SYNT. HONDA HONDA SH 125 DISC PADS - FRONT ON MODELS 2009 ON - MALOSSI SYNT. VESPA ET4 125 2000 on MALOSSI SPORT FRONT DISC PADS PART NUMBER VM625049 BRAKE PADS sport - MHR - MHR SYNT Brake pads they were born on the racetrack, but they are perfectly suitable for the chaotic driving conditions imposed by our city traffic. Malossi Brake Pads have been designed with new ecological materials (a high percentage of carbon fibre and other metal fibres make up the pad s mixture). - Brake Pads Sport feature increased braking life compared to the original pads and in addition they supply a greater braking power even at lower speeds. - Brake Pads MHR are slower to reach working temperature but provide exceptional braking at elevated speeds where deceleration is needed the most. - Brake Pads MHR Synt : sintered without asbestos, are manufactured with a specific .